In Hand - Episode01-02 - Bagikuy! Tetsu Himokura (Tomohisa Yamashita) is a parasitologist. He enjoys researching the lives of parasites at his home laboratory and he barely leaves his home. He also has assistant Haruma Takaie to help him. 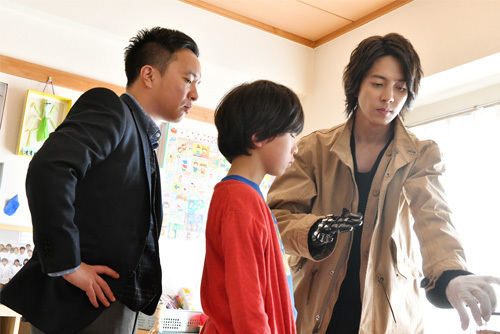 Tetsu Himokura’s right hand is a robotic prosthetic hand. He is very smart, but blunt to others. Tomoe Makino is a bureaucrat from the Science Medical Countermeasure Office at the Cabinet Secretariat. He visits Tetsu Himokura. Tomoe Makino asks for cooperation with Tetsu Himokura to work on unknown creatures and diseases. Based on manga series “In Hand” by Ao Akato (first published 2016 in manga magazine Monthly Afternoon).